I did not know anything about Social Work when I graduated from high school. The profession did not cross my mind nor had been introduced in our career orientations in school. It was my uncle, the then Science Division Supervisor of the Department of Education, who asked me to enroll in Social Work. I did not have much choice then since he was the one sponsoring my studies as my parents could not afford to send me and my five siblings to school. The degree was not heard of in our province of Leyte. My folks just shared with me the little knowledge they had about social workers – they were the ones distributing rice and sardines during disasters. I took the course anyway. In my academe years, I learned to love the course -- I learned more about myself. I had a new understanding of my past experiences and imperfect family life. I learned to be more patient and receptive of changes. While I started to appreciate social work as a profession, I was dismayed with the paper works involved. I hated documenting conversations, narratives and other reports. I disliked my professors who demanded us to submit numerous reports. I never had a choice though but to continue my studies. During our community placements, it was even clearer that we have to do casework, group work and community study in one. This meant documenting each step of every activity -- asking and helping resolve community problems. How I detested the routine! When I finished my four-year course, I joined my classmates in a review class to prepare for the licensure exam. We then went to Manila just in time for the Professional Regulation Commission application and board exams. It was the first time for most of us to be in Manila. The probinsyana in me was so amazed by the number of vehicles plying various routes. Crossing the street was a challenge. I followed my parents’ deafening order: “be careful in crossing the streets, stop, look and listen. You might crash”. When our board exams was over, I immediately went back to my hometown and waited for the result. While waiting for the result, I heard of the vacancy for a CIDSS (Comprehensive Integrated Delivery of Social Services) worker at the Regional Office of the Department of Social Welfare and Development (DSWD). I went to a series of interviews and tests and was, eventually, hired. I was a project employee for one year, assigned to three (3) rural barangays in Southern Leyte. As a CIDSS worker, I experienced to ride the habal-habal (a motorcycle with extended seat to accommodate more passengers in a row), trek long, mountainous and NPA (National People Army)-infested terrains. The obstacles I faced did not dampen my spirit. In fact, I learned to enjoy the kind of social life it offered me – like befriending NPAs, dancing during community socials, hopping from one house to another to eat and sleep amongst strangers, drinking from shallow river, among others. The work humbled me. I learned to live a simpler life. I knew in my heart that the people I associated with made a significant impact in my life. They helped me improve as a person, and slowly, I understood myself, my environment and the people I worked with. I came from a laid back barangay that only a few can pursue higher education. I lived with my paternal uncle and grandfather since I was five years old until I finished college. My paternal uncle influenced me significantly. He valued education so much. For him, having an education was the only vehicle to rise from poverty. My paternal uncle instilled positive values in me and my other cousins. I could say that we underwent a stern training -- we have to wake up early, do the household chores, read newspaper and always abide his orders. When I was younger, it was hard to understand him. I hated his way of disciplining us. He wanted all of us to be in the house when night time strikes. No one should be out if we have no classes. He made us work if there were no classes. We had dry palay, send them to milling outlet, go to the farm, among others. During those times, I wanted to go back to my family but I always had second thought. We were six siblings and it was impossible for my parents to send all of us to college. My parents could barely make both ends meet. I must have adapted my uncle’s value for education so I decided to stay. Looking back, I could only appreciate how my uncle brought me up. I would not be as disciplined as I am now if I it was not for him. He was the one who inspired me to be a better person. When I married my husband in 1997, we decided to move to Manila. I immediately landed a job in Bantay Bata 163 (BB163). The program was new then. I was one of the prime movers. My 15-year journey as a Social Worker of BB163 has never been a bed of roses. I have my share of funny, sad and happy stories. I started as a rank and file employee -- manning the 24/7 hotline, receiving and processing calls. To others, the work seem to be menial but lest they realize, that the work of a telephone counselor is very critical. It is a life of a child that is at stake after all. I still remember the time I cried over a report of a sexual abuse. How I hated and condemned the father who violated his 9-year old daughter’s trust and innocence. It was a call from classmate’s mom. She reported that her daughter’s classmate related of the sexual abuse being perpetrated to her by her biological father. The victim’s mother has no knowledge of the abuse since she left their house early in the morning to purchase various vegetables for vending. Every time she left, her husband would transfer to the room of their 9-year old daughter and abuse the innocent child. With threats from the victim’s father, the 9-year old girl suffered in silence…until she told her classmates of her ordeal and her classmate’s mother eventually called the BB163 hotline. This girl was rescued. Her mother was totally blind of what was happening. She revealed that her husband had no vices. The rescue operation was hindered by the mother’s refusal to believe her daughter’s disclosure even if it was supported by the result of the medico legal. 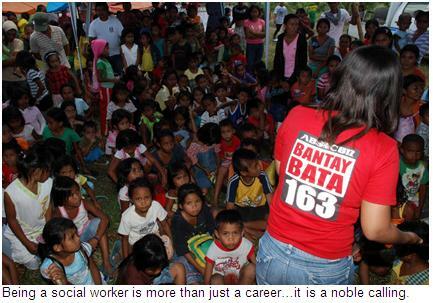 The Bantay Bata 163 team was compelled to temporarily take custody of the child. 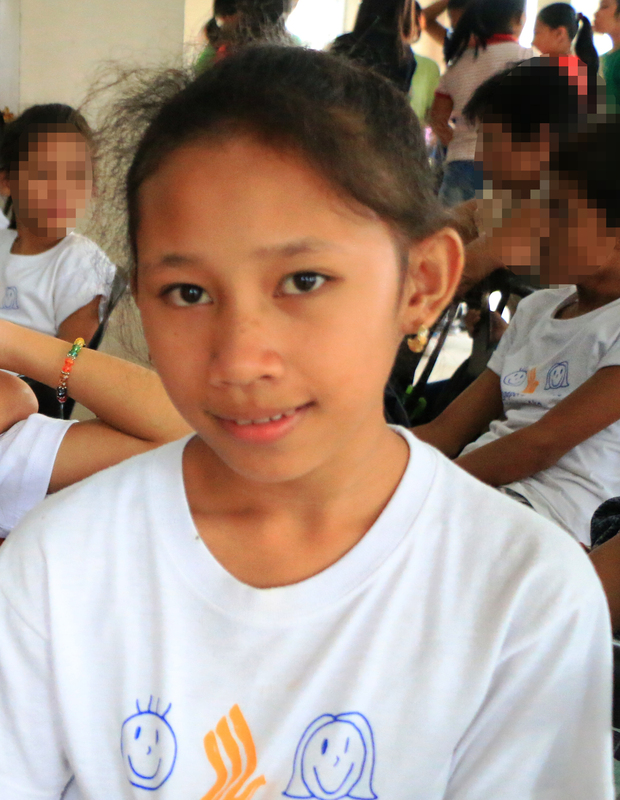 The girl stayed in Bantay Bata 163 Children’s Center and underwent rehabilitation. Her mother was also given intervention while her father was incarcerated. The above case was just one of the many cases that we work on. We receive reports about severely battered children who were left almost lifeless. We have various neglected siblings, abandoned special children, among others. While I continue to work in the organization, I also grew and learned that being a social worker is more than just a career, it is a noble calling. Looking back, would I still take Social Work as a profession? Yes. This is my life mission.